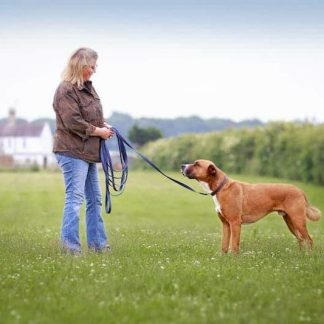 Dog Walking Belt – an adjustable 50mm dog walking belt to make walking dogs who pull an absolute dream. General hands-free dog walking pleasure! 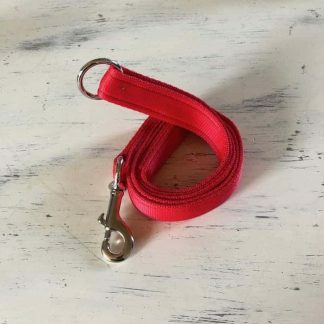 Dog Walking Belt – the first of our dog walking accessories range to help solve dog walking dilemmas and lead to a stress-free hands-free dog walking experience. 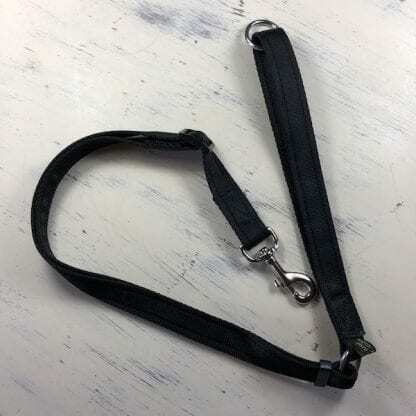 This walking belt was redesigned in February 2019 to provide a better experience for those looking for answers to dog walking dilemmas such as pulling on the lead, strong or heavy dogs, walking multiple dogs or just general ease of walking your dog/s hands-free. The base product comes with the walking belt on its own. The product has optional upgrades to include 1-4 lead attachments and/or 1-4 Super leashes (adjustable leads). 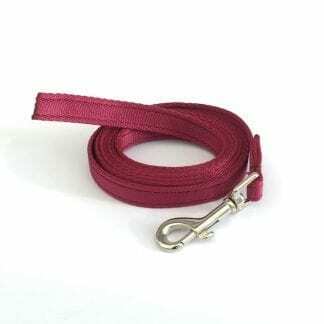 Super Leash adjustable dog lead – an optimum dog walking length of 1 – 1.35 cm. The dog walking belt is an adjustable waist belt made from 50mm webbing. You have the option to customise the belt by having it padded with fleece. Works perfectly with any dog lead with a ring on the handle, however, we have designed an adjustable lead called the Super Leash that can be bought as part of this bundle. What fittings will your dog walking belt come with? The 50mm dog walking belt comes with metal D rings and sturdy plastic buckle with heavy duty hook & loop Velcro to adjust. If you purchase the dog walking belt bundle, you get the (up to 4) belt attachments (see main product image of the short double ended section) & the Super Leash. I bought the dog walking belt with padding because I’m a professional dog walker with a wrist problem. I’m very impressed with the quality of the belt, it’s beautifully made. It’s very comfortable, even when the dogs are pulling and it’s also very easy to adjust with strong Velcro. It’s made my job so much easier and taken the pressure off my wrist. It’s great to be hands-free and makes collecting the dogs together at the end of the walk so much easier. I would definitely recommend this belt to all dog walkers. I was looking for a walking belt and searched many different sites and accidentally stumbled across this site. So glad I did. Quality and service absolutely superb absolutely delighted with the walking belt so much so I went on to order a long training lead for recal work. Got fluorescent yellow so the line would be nice and visible. Excellent service and fast delivery so pleased with the products I’ve had. Sorry did get your email about feedback yesterday or the day before and have been meaning to reply! As a basic entry level walking belt it’s spot on. My ageing staffie who likes to just plod along with the occasional burst of jogging (wouldn’t call it running ha ha ha) it more than does the job, it doesn’t dig in or rub. But when I’m walking my clients nine month old GSD x Husky X Staffie after five to ten minutes it does dig in and rub on your lower back. She is a puller, full of energy and excitement, the world is still full of wonders and random things for her to explore and sniff out. I did have a few thoughts that you could do a range of walking belts? The one I bought as your basic entry level walking belt. Then do two others that are bigger maybe two or three inches deep. One maybe elasticated and the other out of the normal fabric. And could even venture in to a Canicross/Bikejoring range as that’s becoming a very popular sport for people with dogs. ** From Sarah – Hi Benn, Ive marked your review as a 4 star because of your feedback about the belt when using with larger breeds. Talk about food for thought. So I’ve already sent you an email asking if you will test run a 50mm belt for me, I’ll also pad it. All I ask is for more great feedback like this one. Feedback like this helps me improve my products. To people viewing this review – I have copied Benns email IN FULL and will be trialing a 50mm padded belt next week (commencing 26th Feb 2018). The walking belt was just what I was looking for. It is very comfortable, easy to attach a lead with the carabiner clip. Both the leads – great length, light and easy to wipe clean after long muddy walks – and the belt are well made.